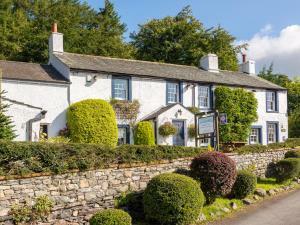 Scales Farm Country Guest House017687 79660work Guest HouseNestling on the slopes of Blencathra, 6 miles from Keswick and with spectacular views across the central fells, Scales Farm offers quality accommodation and a superb location to explore the Lake District. The 17th century farmhouse features a welcoming traditional beamed lounge with a wood-burning stove and breakfast room available to customers at all times, ample private parking, secure bicycle storage and drying room. All our bedrooms are en-suite with TV/DVD/DAB, Wi-Fi, fridge and tea/coffee making facilities. We have one room suitable for our mobility impaired guests. Three of our six rooms are dog friendly with direct access to the garden and our own paddock. Breakfast includes a buffet, full English breakfast or alternatives. Packed lunches provided on request. With the popular White Horse pub, located next door, you can enjoy a relaxing lunch or evening meal of Lakeland food, drink and views. Scales Farm Country Guest House sometimes limits bookings to 2 or more days. A bright double room with a view up onto the fell. Comfortable chairs are provided in the room and there is space for a child's cot (which can be provided if needed). With direct access to the garden, the room is ideal for pet-owners. A popular, secluded, double room. Comfortable chairs are provided in the room. With direct access to the garden, the room is ideal for pet-owners. A double room with a fine view up onto the fell. There is for a child's cot (which can be provided if needed). Comfortable upholstered chairs are provided in the room. A large, flexible double room with a fine view up onto the fell. The room can be configured with a super-king sized bed or with twin single beds and there is also ample space for additional beds or a child's cot (which can be provided if needed) to make this perfect for a family room. Comfortable chairs are provided in the room. Nestling on the slopes of Blencathra, 6 miles from Keswick and with spectacular views across the central fells, Scales Farm offers quality accommodation and a superb location to explore the Lake District. Located just off the A66, Scales Farm is easy to reach by road, just 10 minutes from M6. Complementary pick up from Penrith main line railway station is available for guests arriving by train. We also provide a drying room, secure cycle storage, fridges in rooms (note that minibars in bedrooms are stocked with a selection of soft drinks). There is a pub/restaurant next door and direct access to fells. Children welcome from any age. Arriving from Keswick - take the A66 towards Penrith. Pass Threlkeld village on the left and continue up the hill for one and a quarter miles. Take the left turn by the signs for Scales and the White Horse Inn. Scales Farm is on the left before the White Horse. Arriving from the M6/Penrith - leave at junction 40 and take the A66 in the direction of Keswick. Eleven miles from the motorway take a small turning on the right signposted for Scales and with a board for the White Horse Inn. Scales Farm is ahead, next-door to the White Horse. Arriving by Train - There is a main line train service into Penrith with an excellent service to London and Glasgow. We can pick you up from Penrith station. Arriving by Bus - There are regular bus services from Penrith or Keswick which stop directly opposite Scales Farm. Ask the driver to stop at the White Horse, Scales.